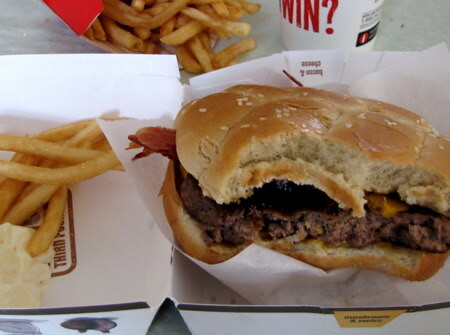 Food Friday: McD's Angus Third Pounder with Bacon and Cheese Burger ~ I Can Do That! I can't believe I ate the whole thing. McDonald's 100% Angus Third Pounder with Bacon and Cheese Burger: a third of a pound of juicy and flavorful Angus beef patty with a slice of cheese on the bottom and topped with mustard, ketchup, slices of crisp sweet red onion, pickles, 3 slices of crispy bacon, and another slice of cheese on a soft but sturdy 5-inch bun. Yummy! i want to try that.. Sounds yummy again ! Although I am not a hamburger fanatic. Dj, Sidney, and cookiespink, I was surprised I liked it...it's really good. Kayni, I can't remember the last time I ate McD's burger, maybe a year or two ago. This one is good and I really liked it.